Ahh, the daily commute. I’ve heard of some pretty unbelievable ones. In comparison, mine is just not that bad. But that doesn’t stop me from complaining about it. What confounds me is that my drive to work is usually pretty straightforward, but my drive from work often takes 2 to 3 times as long due to traffic. What the heck! By the time I get home I’m just done and any previously conceived ideas about cooking up a nutritious dinner have flown out the car window. 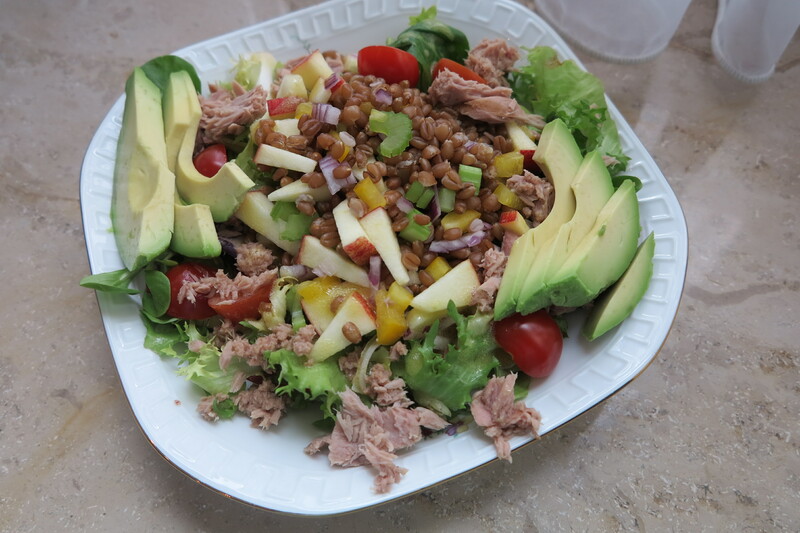 And that’s why recipes such as this week’s French Fridays with Dorie selection, Wheat Berry & Tuna Salad, are a lifesaver. This dish was delicious and will absolutely be added to my weeknight repertoire. This is exactly the kind of leftovers which I want in my fridge when I get home. I made the base recipe (wheat berries, onion, celery, & apple) on Sunday night and just added the dressing and remaining fresh veggies when I got home from work. Don’t laugh, but I was too tired to even boil the eggs and just left them out. Pathetic, I know. This entry was posted in french fridays with dorie and tagged Around my French Table, salad, vegetarian, whole grains. Bookmark the permalink. There are nights when even the simplest of dinners seem to be beyond my abilities after a day at work. It is nice to have easy “go to” recipes. I liked that this was a “one dish” meal. This one was so easy once everything is on hand. Great for dinner on an exhausted night.I made the hard-boiled eggs the day before, while I was cooking the wheatberries. Looks delicious! Definitely one to add to the weeknight repertoire – cook those wheat berries on the weekend and have it ready for the week! Your salad looks so pretty – mine is kind of more a splodge on a plate. Cheers to the weekend and no commute! Delicious looking salad! How nice it worked so well for you. We loved it, too! I will definitely be making it again…a keeper for sure! Enjoy your weekend, Rose! Not pathetic at all. I agree, this is a great basic recipe and you can use any grain with it. (Just remember to boil the eggs the night before.) What I liked about it was that it was so filling. Dorie was right – I didn’t even need bread. Glad this will be a staple at your house as well as mine. Rose, your wheat berry salad looks wonderful – this was a fabulous recipe, I agree and although I am running very late with comments this week (sorry for that) I wanted to let you know that I really like the way you presented your healthy and delicious wheat berry salad with all those wonderful veggies and eggs and tuna! I already made it twice since last Friday for two school end parties and have not tired of this recipe yet. I thought of this dish as a pack and go or come home to kinda of meal too. It gets better in the fridge. I totally understand being too tired to boil eggs! Sometimes it just feels like a lot of work. I want to get in the habit of keeping healthy, versatile stuff like cooked wheat berries in my fridge. I think it would make weeknights much easier.